It is possible to throw a stress-free New Year's Eve party. 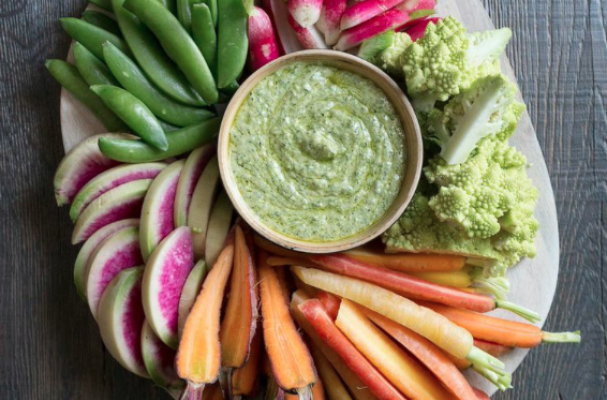 With recipes like lemon parsley tahini dip from Anna Watson Carl at your finger tips, you can enjoy the party as much as your guests. Serve this crudite dip long with a couple artisan cheeses, crackers, and cured meat for an easy no-cook New Year's Eve spread. You can prep the crudités several hours in advance. Place the cut veggies in resealable plastic bags or in airtight containers, cover with moist paper towels, and refrigerate until ready to use. You can make the dip 1 day ahead and store it in an airtight container in the refrigerator. To make lemon parsley hummus, add 1 (14.5 ounce) can of chickpeas, drained and rinsed, to the tahini dip in the food processor and pulse to combine. With the motor running, add 2 more tablespoons olive oil and 2 tablespoons water, and blend until smooth. Season to taste with salt and pepper. Store, in an airtight container in the refrigerator, for up to 3 days.